Very trendy, elegant and smart, orchid is one of the favourite tropical plant. Like in its natural environment, orchid needs specific living conditions and specific care. Our expert florists are sharing some tips with you so you can enjoy this eye-catching plant even longer. To be able to bring them the appropriate care, it’s very important to first understand who they are. Orchids originally come from a tropical environment with a lot of moist, lights but not direct sun. There are 2 families of orchids: epiphytic or terrestrial. Terrestrial orchids live on the ground in a water retentive humus or rotting wood and leaves. To grow in the best condition they need a constantly moist, but not soggy soil. Cymbidium, miltonia, paphiopedilum are terrestrial. Just like some orchids may be killed by being planted in soil when they are not a terrestrial type orchid, giving too much water to some others may sign their death warrant! Indeed many people still do the mistake that as these plants are native from tropical rainforests they need watering several times a week. 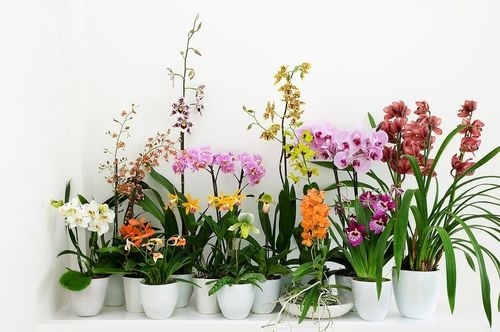 Depending on the type of the orchid and the season, if the plant is in active growth or not, the quantity & frequency should be different, from 5 to 12 days in average. Don’t forget also that orchids hate draughts and always need a good humidity, about 50 to 70%, especially indoor orchids. That’s one of the reason why phalaenopsis are so beautiful when placed in bathroom for example! As a general advise, take care to avoid wetting the leaves when you water your orchid. If they do get wet, simple dry them with a gentle tissue or a cotton swab. Never let water stagnate in the pot otherwise roots will rot. Avoid direct sunlight, your orchid will enjoy light behind a curtain or window blinds. Never, ever cut the air roots off, even if some people may don’t like the look, these grey curling roots are vital for your orchid! Unless you are an orchid expert, we also recommend not to remove your orchid from the plastic pot. You can also use a specific orchid flower food once a month but it’s very important not to overfeed your plant which can damage it. Better less than more! After the last flowers drop, trim the stem all the way down, just above the very lowest node and cut diagonally. This will help to stimulate the growth of potential new flower stem and if you continue to take care of your orchid, it may rebloom! Know someone who is fond of orchid? Make him/her happy simply with an orchid surprise delivery!